Zonkey is zebroid (hybrid of zebra), created by interbreeding of zebra and donkey. Both zebra and donkey belong to the horse family. Despite great differences in the chromosome number, they can successfully mate and produce viable offspring in the wild, in areas near the human settlements, where zebras occasionally search food and water. Besides in the wild, zonkeys can be seen in many zoos around the world where they are usually kept as a tourist attraction. Zonkey has tan, brown or grey coat with prominent black stripes on the legs and belly. Bottom side of the body is light-colored. Zonkey has large head and long ears, just like donkey. Black mane, inherited from zebra, runs from the neck to the black-colored tail. Zonkey can reach 3.5 to 5 feet in height and 500 to 700 pounds of weight. Zonkey is diurnal animal (active during the day). Zonkey is a herbivore. They diet is based on the grass, herbs, fruit and berries. Flat, broad teeth facilitate grinding of fibrous plants that grow in the arid areas. Zonkey has nomadic lifestyle. Due to competition for food and water with other herbivores in the savannas and open woodlands of Africa, it constantly travels and searches new sources of grass. Just like zebra, zonkey has plenty of natural enemies in the wild. Some of the best known are lions, cheetahs, African wild dogs, leopards and hyenas. Zonkey is extremely powerful and fast animals that can reach the speed of 35 miles per hour. It is also very healthy and resistant to many pests and diseases (this trait is inherited from zebra). Zonkey is produced by crossbreeding of male zebra and female donkey. 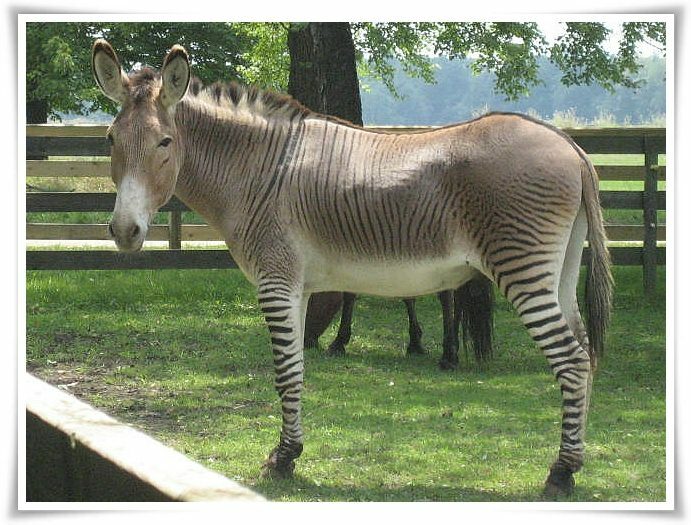 Hybrid produced by interbreeding of male donkey and female zebra is known as zedonk. Zonkey is sterile. They can be produced only through mating of zebra and donkey. Female donkey gives birth to zonkey after 12 months of pregnancy. Baby zonkey is able to walk few minutes after birth. Young zonkey usually stay close to its mother until the age of 5 to 6 months before it becomes ready for the independent life, usually in some other herd. Zonkey often stays in its native herd until the age of 4 years. People have started cross-breeding of zebra and donkey in the 19th century to create animal with great stamina that can be used for transportation of heavy loads and riding. Zonkey is still used as a working animal in some parts of the world today. Famous naturalist Charles Darwin mentioned zonkey in his work. Zonkey retains its wild nature and aggressive attitude toward humans (trait inherited from zebra) even when it is kept in the captivity and in the close contact with people. Zonkey has an average lifespan of 15 to 25 years.